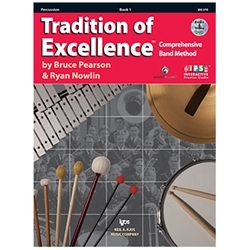 Tradition of Excellence is a flexible performance-centered band method that seamlessly blends classic and contemporary pedagogy, instrument-specific DVD's, and the cutting-edge interactive practice studio technology. Bruce Pearson and Ryan Nowlin present a systematic comprehensive musicianship curriculum that is second-to-none. Each book comes with the unique and revolutionary Interactive Practice Studio, at no extra charge. Today's students will appreciate access to all multimedia components of the curriculum on a single virtual page. And best of all it's fully loaded and ready to use in a performance classroom or on a Smartboard. The printed page has never been such a powerful teaching tool!